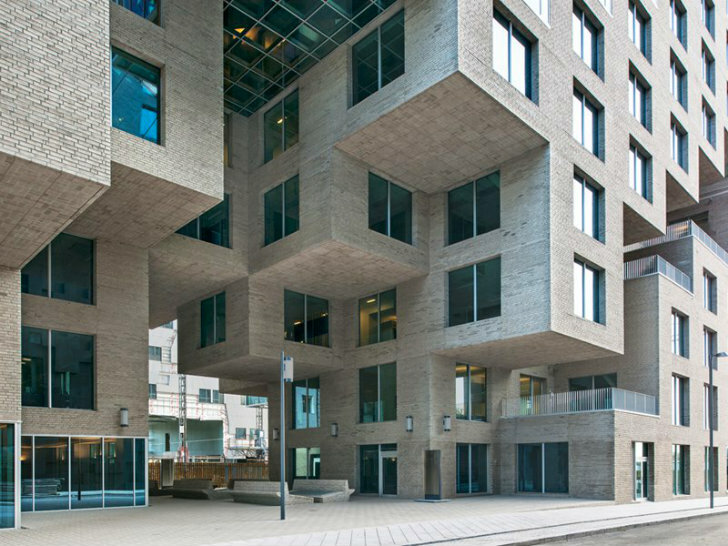 Netherlands-based firm MVRDV has just completed the DNB NOR Bank Headquarters in the Bjørvika Barcode district in Oslo, Norway. Aided in design by DARK Arkitekter and a-lab, the modern office tower consolidates the bank's area offices into one central space. The structure is based on the concept of a 6x6 pixel, which serves as the basic building block to create a dynamic space filled with natural daylight. The scheme for DNB NOR’s headquarters in Oslo was to create a clear identity for the company in the city and provide excellent working conditions and spatial qualities for their employees. MVRDV’s design is based on 6×6 meter pixel, which is the most basic working space, and a steel rack system to create a flexible volume. The building is wrapped in stone and gives the impression of a solid piece of rock. The pixels are cut out and pushed out in places to provide variety and create an internal passageway. Tops of some of the pixels are used as outdoor terraces and roof gardens. The building provides space for 2,000 flexible work spaces, a panoramic 140 seat canteen on the top level, an executive lounge with a view over the fjord, a board room, the DnB NORs trading room with 250 work stations, and the main entrance with a reception and access to the concourse. An internal passage cutaway provides natural daylighting into the heard of the building, while natural ventilation keeps the interior cool in the summer. High performance glass minimizes heat loss through the winter and all offices enjoy natural daylighting. MVRDV’s building is one of three structures that will form the DNB cluster and the other two will be completed by May of 2013. The scheme for DNB NOR's headquarters in Oslo was to create a clear identity for the company in the city and provide excellent working conditions and spatial qualities for their employees. MVRDV's design is based on 6x6 meter pixel, which is the most basic working space, and a steel rack system to create a flexible volume. The building is wrapped in stone and gives the impression of a solid piece of rock. The pixels are cut out and pushed out in places to provide variety and create an internal passageway. Tops of some of the pixels are used as outdoor terraces and roof gardens. 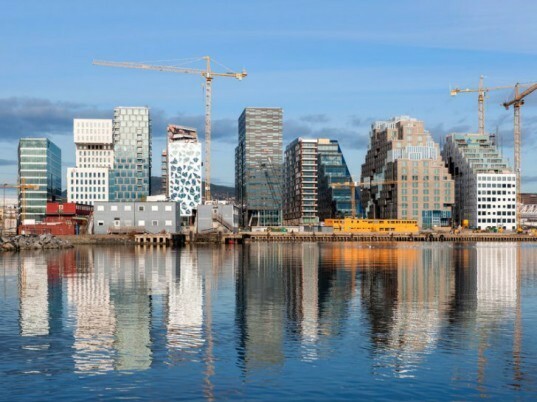 The building provides space for 2,000 flexible work spaces, a panoramic 140 seat canteen on the top level, an executive lounge with a view over the fjord, a board room, the DnB NOR’s trading room with 250 work stations, and the main entrance with a reception and access to the concourse. An internal passage cutaway provides natural daylighting into the heard of the building, while natural ventilation keeps the interior cool in the summer. High performance glass minimizes heat loss through the winter and all offices enjoy natural daylighting. MVRDV's building is one of three structures that will form the DNB cluster and the other two will be completed by May of 2013. A series of lounges provide lots of space for meetings.